Stein’s lineup of the late night heroes who wield wit and humor like surgical scalpels includes Jon Stewart, Jay Leno, Amy Schumer, Jimmy Fallon, Chelsea Handler, Samantha Bee, Larry Wilmore, Bill Maher, John Oliver, Trevor Noah, Stephen Colbert & David Letterman. 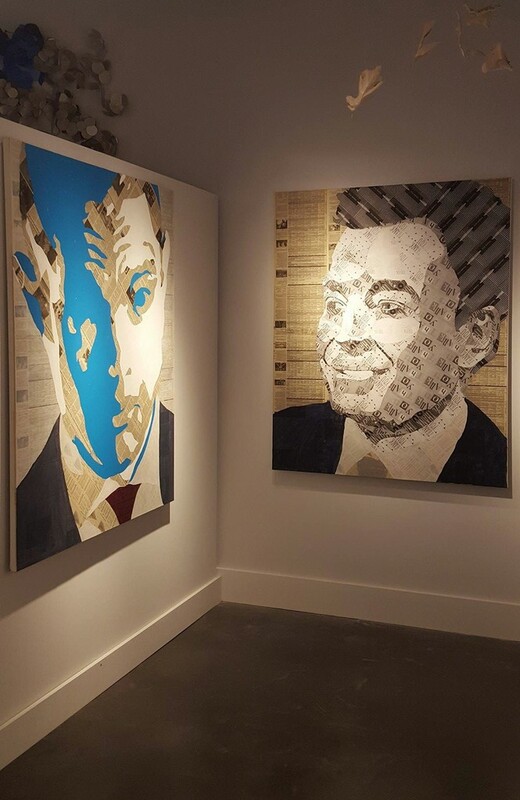 Opening Reception: November 12, from 5 to 8 p.m.
What trumps artist and “recovering lawyer” Geoffrey Stein’s 2015 mixed-media-on-paper portrait of Donald Trump, created with materials from the presidential candidate’s third of four corporate bankruptcies? Stein’s magnetic and masterful portraits of the late night comics who have been making a living by shredding the @realDonaldTrump for the fits and foibles of a campaign, and life, that begged to be lampooned. 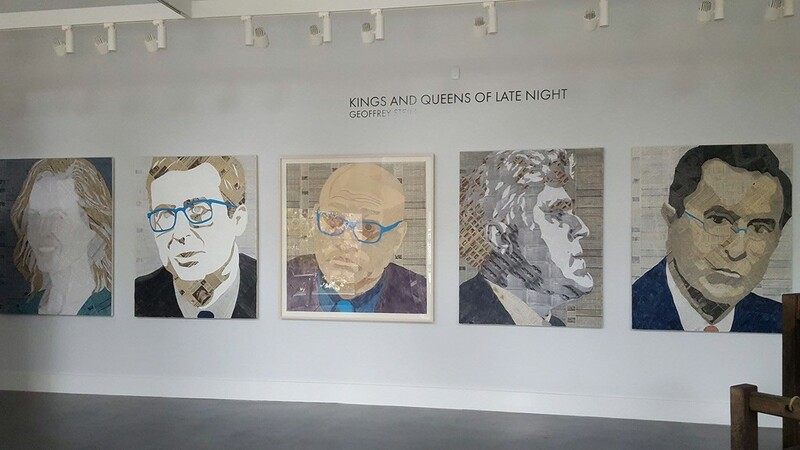 In his new show at The Lionheart Gallery in Pound Ridge, N.Y., “Kings & Queens of Late Night,” running from November 6 to January 2, 2017, Stein paints collage portraits of an all-star cast of network and cable comedy and punditry. Stein’s Lionheart Gallery lineup of the late night heroes who wield wit and humor like surgical scalpels includes Jon Stewart, Jay Leno, Amy Schumer, Jimmy Fallon, Chelsea Handler, Samantha Bee, Larry Wilmore, Bill Maher, John Oliver, Trevor Noah, Stephen Colbert and David Letterman. 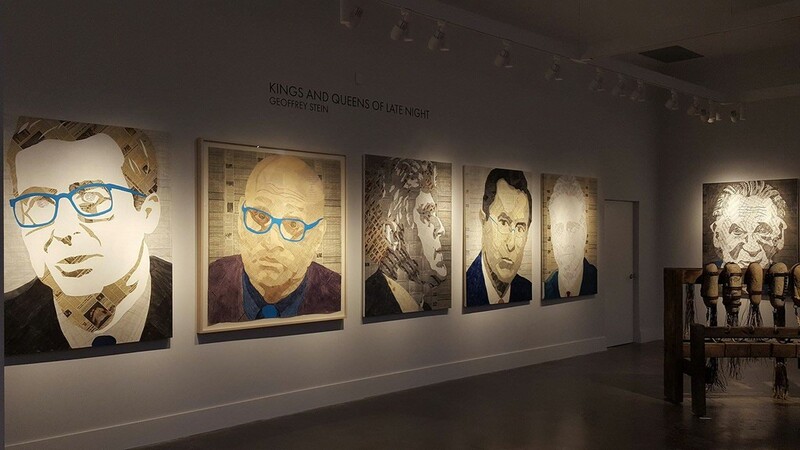 Examples from this exhibit include Jon Stewart’s portrait made with the 9/11 Responders’ act he championed, Amy Schumer done with her cousin Chuck Schumer’s Gun Control bill, Jimmy Fallon created from thank you cards, and John Oliver done with USA Today and the London Tube Map. “I have always made art. I made wood and metal sculptures as a kid, worked as a photographer for the local paper in high school, and briefly studied product design at Parsons. After graduating from Bard Collage, and looking for a job in New York during the recession of 1983, I fled to law school. Proficient across the media of drawing and painting—and devoted to making pencil and conte life drawings to stay sharp—Stein engages in a dialogue between abstraction and realism as he carefully balances presences and absences in portraying subjects to “find out what I think about the world,” as he says in his artist’s statement. 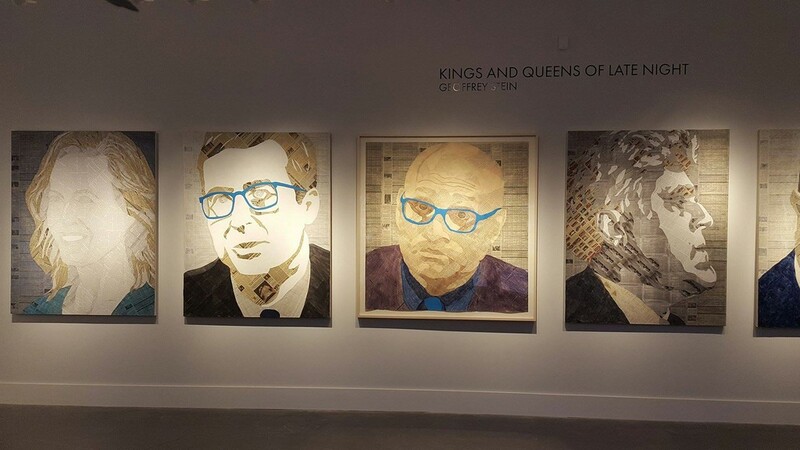 The Lionheart Gallery exhibit is a departure for Stein in one sense. It’s the first show he has directly painted toward, rather than showing an accumulation of works that ultimately gelled thematically. In addition to his MFA from The Slade School of Fine Art, 2007, and New York Studio School Certificate in Painting, 2004, Stein has a law degree from Albany Law School, 1986, and a Bachelor of Arts degree from Bard College, 1982. Among his most recent awards is a 2016 Juror’s Prize, Best Mixed Media, Art Show Bedford. The juror was Peter MacGill of Pace/MacGill Gallery. 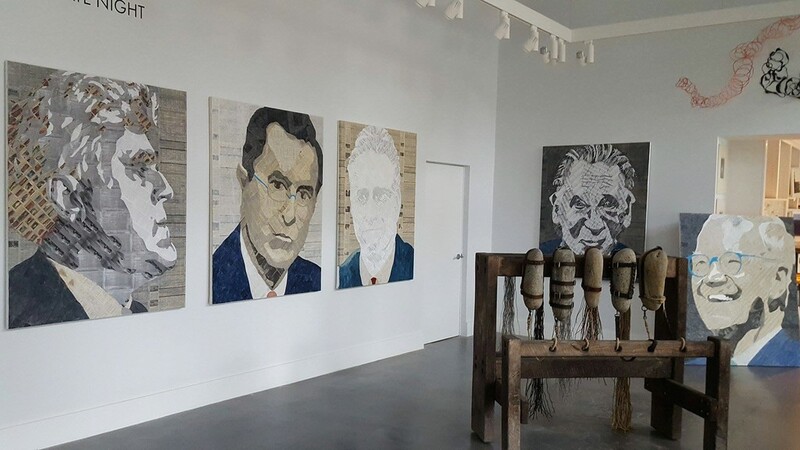 The Lionheart Gallery is open Wednesday through Saturday, from 11 a.m. to 5 p.m., and Sunday from noon to 5 p.m. For more information and directions to the gallery at 27 Westchester Avenue in Pound Ridge, N.Y., visit http://www.thelionheartgallery.com or call the gallery at 914.764.8689. An opening reception for the exhibit is scheduled for November 12, from 5 to 8 p.m. Geoffrey Stein will participate in a salon-style talk November 20, beginning at 2 p.m. Call the gallery at 914.764.8689 for details.